The main outputs can operate in constant voltage or constant current mode with automatic crossover and mode indication. Coarse and fine voltage controls are provided. 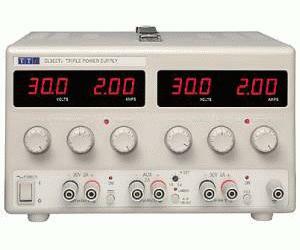 The current control is logarithmic enabling low current levels to be set accurately. The EL302Tv incorporates a third output variable between 1.5V and 5.0V with a fixed current limit of 2A. The set voltage can checked using the digital displays. The popular EL302T has been replaced with the EL302Tv, offering fully variable output voltage and higher current on the third output.